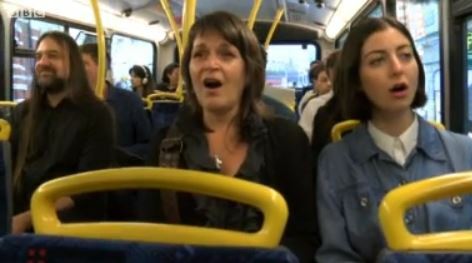 Four professional singers interpret their journey on a London bus guerrilla-style to the surprise of passengers. Filming and reporting by Josephine McDermott. Josephine lived in China for four years, working in the Chinese media in newspapers and TV and blogging for the Daily Telegraph. Over 1,200 posts later and now working in Britain for the Victoria Derbyshire programme, this is a log of her online, TV and radio work.